Santa Cruz County is an official StormReady Community! 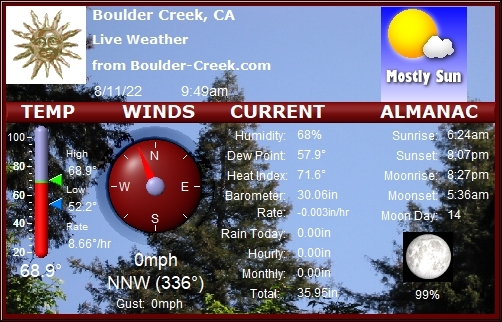 Check out Boulder-Creek.com's Weather Warnings and California EDIS for latest alerts and bulletins. Santa Cruz County OES. Sentinel's EmergencyWatch. Partly cloudy late in the evening then becoming mostly clear. Lows around 50. Light winds. Partly cloudy. Highs in the 60s to mid 70s. South winds 5 to 10 mph. Partly cloudy. Highs in the mid 50s to lower 60s. Northwest winds 10 to 15 mph. Partly cloudy. Highs in the 50s to upper 60s. available at this time. Check back again at the next forecast run. This is a map of personal weather stations in the Bay Area. Click on a temperature icon to go to that stations' weather report. Personal Weather Station data is supplied by the Weather Underground. METAR station data is provided by NOAA. This map is updated on the half-hour. Hot links are updated on the quarter-hour. Browser must support ALT image tags. If you are using FireFox, use can use this extension. Click on one of the menu choices to see the current weather conditions. Updated every couple hours from NOAA. 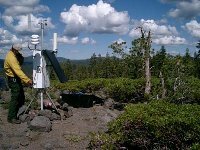 RAWS, Remote Automated Weather Stations, are typically owned and maintained by local wildland fire agencies to monitor local fire danger conditions. These weather stations collect, store, and send data to the National Interagency Fire Center in Boise, Idaho via the GOES satellite. Fire managers use this data to predict fire behavior and monitor fuels, resource managers use the data to monitor environmental conditions. Usually updated every hour. Link opens into a new browser window. Use the raw data text link to get last 24-hours. All raw data records day of the month and times in Zulu (UTC), subtract 7 hours if local time is PDT (UTC-7), 8 hours if local time is PST (UTC-8). More local San Lorenzo Valley weather stations can be found here! 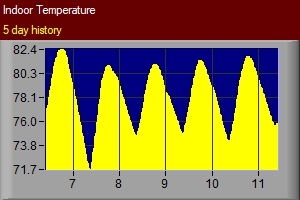 Click above to get today, yesterday, past week and month graphs from KCABOULD3. Weather data updated every 15 minutes. Unless power outage or system issue intervenes, after all the weather station is in a California rain forest. A 24 hour time lapse movie is available below of the same scene, courtesy of WeatherUnderground. Note that this feature is still in beta mode SO HICCUPS ARE TO BE EXPECTED. The time lapse movie frame is currently updated every five minutes with the above image. Due to the poor quality of Wunderground's Flash compilation. 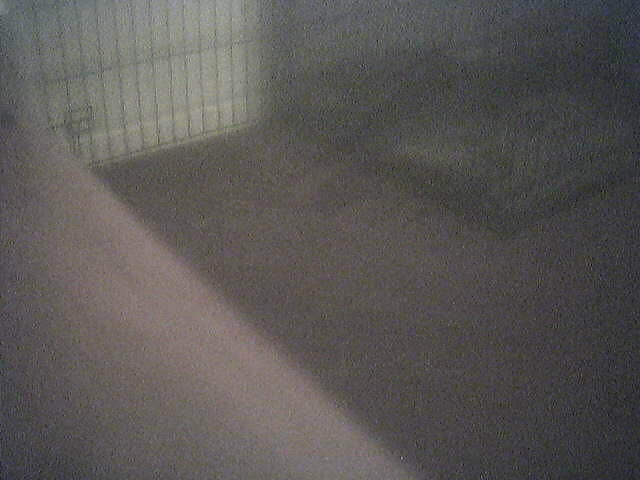 I've managed to put my own "yesterday" 24 hour time-lapse weather webcam that shows both 5 minute incremental images from the webcamera along with the weather conditions superimposed over the webcam image. The timelapse webcam movie updates at midnight for the previous day. This feature is under development and is subject to change. 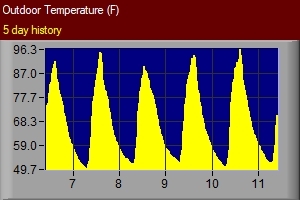 Outdoor temperature sensor is currently at a southern exposure couple hundred feet above the valley floor above a mile north of town. Previous to August 7th, the station was located on Bear Creek Road near town. For local downtown temperatures - check out San Lorenzo Water District. 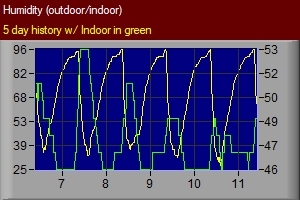 Indoor/Outdoor humidity. Outdoors is yellow and uses left-hand abscissa. Indoor humidity is a thin white line and uses right-hand abscissa. 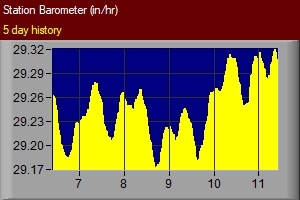 Note: Graph displays Station (Raw) Barometric Pressure. Current pressure trend unfortunately records time interval changes. Check graph to determine in general whether pressure is increasing or dropping. 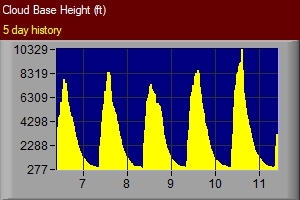 Note: Wind conditions in downtown Boulder Creek typically are much higher than what is represented here due to 'valley wind-tunnel effect'. This weather station is off Highway 9 about a mile from Boulder Creek and sits a couple hundred feet above the valley floor . 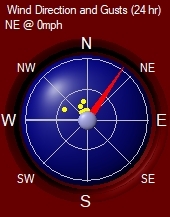 On the wind rose compass, the inner band is 10 mph and the outer band is set to 20 mph. Anything beyond the 20 mph band is high winds! 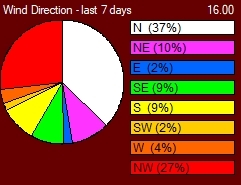 Due to power outages, some of the graphs may not be accurate as to real-time. 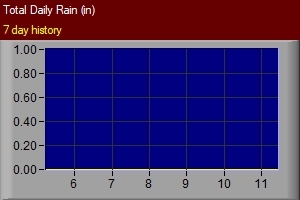 Rainfall totals however are accurate, once power is restored since the weather base station has battery backup. Typical: Sporadic rains start in October with heavy rains starting in January. Rains decrease in intensity in April-May. Rainfall totals are reset the 1st of every October. 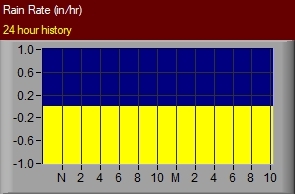 Better detailed rain graphs (in/hr) can be found on the WeatherUnderground daily/historical report for this station. This graph shows this year's rainfall totals compared with the total rainfall from our previous year. Note: rainfall year is calculated from the 1st of October. Current NOAA Weather Summary for this weather station. Click on the year for NOAA summary reports for year and individual months. The page will open up into a new browser window. 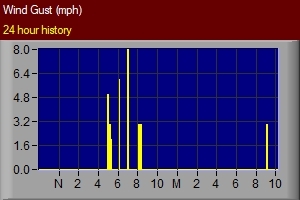 The 2007 weather summary is usually updated the first of the month. Note: The GOES Solar X-ray Imager has gone hay-wired and has been taken offline while the SXI team tried to troubleshoot the problem. Therefore the SXI solar images are currently not available. For the latest in operational status, please see this link. Copyright © 2002 All rights reserved Boulder-Creek.com. Send comments to either Guest-book or webmaster@boulder-creek.com.